I turn on my favorite music to keep us company as we do the mundane task of transforming mounds of laundry into neat and organized piles sorted by type and owner. She begins twirling, pirouetting, practicing her newly learned ballet steps. “Mommy, look at this!” Her twin sister joins her, and what was previously ordinary is now transformed into a dance performance worthy of a stage. My husband and I smile at the privilege of being the audience to such a play. 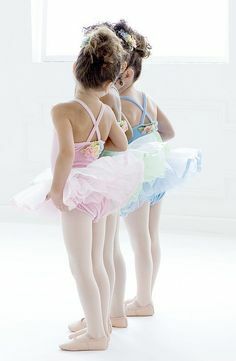 They grab their blue leotards and ballet shoes and their dance takes new levels as they sway and spin and leap and laugh. Soon we are mesmerized. Transfixed by their art and spontaneity and, in a word, glory. Did you know that people who experience awe 2-3 times a day are more emotionally and physically healthy than those who don’t? We have much to learn from those who haven’t lost the wonder and awe of the ordinary, found in the mundane. I who so easily stress and grow anxious and worried and bothered about too many things – I need them as much as they need me. They bring me back to what’s important, drawing my eyes above to their Creator who delights in them and me with an unending love eager to be interrupted to watch my dance. Love it, Heather! I’m inspired! Great, Mom! Thanks for commenting. Beautiful post. I love that children do things like that, so easy for them, something we need to learn. Exactly … We all have it in us though don’t we? We started where they are. Heather, thank you for the reminder of how our Father delights in His children when they are so like children-excited, happy, in-the-moment joy of life, in the form of a dance here; something else perhaps tomorrow. But the joy is in the NOW-something children do so very well. May we mimic their joy! Thanks for stopping by Christy! I’m honored by your presence. And totally agree that dancing is so good for stress relief.